Come experience our new "Comforts of Home" bedding collection.At the Candlewood Suites Columbia Missouri Hotel, we put the amenities where they really count: in your room. Big and built for comfort, it's the ultimate suite for the business traveler. Each suite has a full kitchen complete with microwave and full size refrigerator. Work efficiently at your oversized executive desk with two separate phone lines-check email and talk on the phone at the same time. Relax in the overstuffed recliner while you enjoy the CD player and VCR. Borrow your favorites from our free video and CD library. Work off some stress in our fitness center or visit our Candlewood Cupboard. You can purchase meals, snacks and sundry items at value prices. We are conveniently located off I-70 at Exit 128A, just minutes away from the University of Missouri and Columbia College. 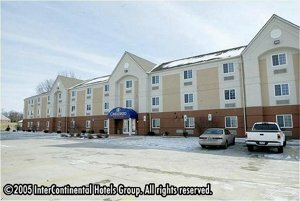 The Candlewood Suites Columbia Hotel is also close to many attractions including Katy Trail, Downtown Columbia and Area Hospitals including Columbia Regional, Boone Hospital, and University Hospital. This hotel is committed to providing accessible facilities under the American Disabilities Act. If your accessibility needs are not met, please contact the Hotel Manager on Duty. Should you require additional information regarding accessible facilities for guests with disabilities, please call 1-800-Holiday (U.S. and Canada) or contact the hotel directly. For the hearing impaired, TDD service is available at 1-800-238-5544 within the U.S. and Canada.